The Mühl STUB is a shorter version of the Muhl that gives the user 2 tools in one. At 22" and with a one inch barrel, it's the perfect length for doing single arm drills. Most of the 24oz. weight is close to the hands giving the batter optimal control. Lead arm drills are great for strengthening the pull arm, which is typically a hitter's weaker arm. At game time simply attach the weight and you have a perfect on-deck bat at 52 ounces. The short nature of the weighted Stub makes it great for strength training drills too. Pitchers even use it for stretching the shoulder joint. The Mühl STUB is for batting drill-training purposes only and is not intended for any purpose other than specified. 1. Assume regular batting stance. 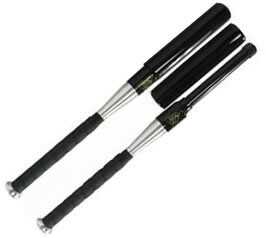 Use it to hit soft tosses or to hit from a batting tee. Begin by using the front arm only to hit 10-15 pitches. Place hand of free arm in other armpit to provide stability. 2. Change arms, using only the back arm to hit 10-15 pitches as in step 1. 3. Repeat, switching arms if time allows. 4. At game time, attach weight by securing threaded weight to the barrel of The Mühl STUB by turning in a clockwise direction until it is snugly secured in order to prevent separation. It makes a great on-deck warm-up bat or use the Stub for wrist and forearm strengthening exercises. 5. Remove the weight by turning in a counter clockwise direction. "We feel The Muhl is a great hitting tool. We use the Muhl EVERYDAY in practice. Whether using the Muhl for soft toss, short toss or regular BP, we've found a successful training bat that helps develop more consistent contact. I highly recommend the Mühl."